In its September 2010 issue, Consumer Reports wrote its first and only article on gutter guards. That article has been accessed tens of thousands of times over the years. 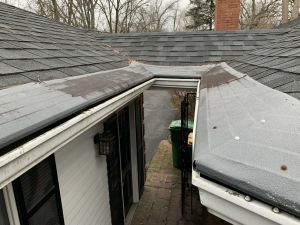 We wrote a blog story about it back in 2010, talking about some of the results — mostly focused on the lower-end gutter guards that were featured. 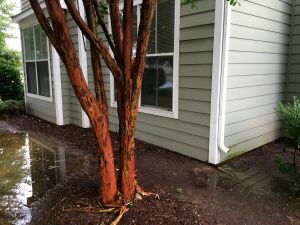 One of the top search terms on our blog is best gutter guards consumer reports, so I have decided to update our thinking on what was written then and the state of the industry now. The magazine took the time to write an article about gutter guards. Each year, CR polls its subscribers to give their thoughts about cars and trucks. 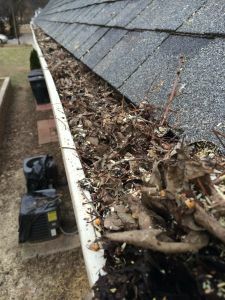 They regularly review appliances, vacuum cleaners and lawn mowers, but they had never written about gutter guards — one of the most confusing products on the market. While they featured about 20 gutter guards, they focused on only a few real contenders. The top rated products were micro screen gutter guards — LeafFilter and GutterGlove Pro. LeafFilter was rated the top “professionally installed” gutter protection system and GutterGlove Pro was rated the top “do-it-yourself” gutter guard. The truth is, both systems are professionally installed systems. While Gutter Glove may have been available as a DIY product back then, it was designed for gutter pros, not homeowners, to install. It’s too complicated of a system to install as a DIY gutter guard. Since then, Gutter Glove has introduced several more gutter guards, some of which are sold as DIY solutions at places like Costco and Home Depot (good news for weekend warriors). Consumer Reports also featured several plastic gutter guards by Amerimax and a few professionally installed solid gutter covers. If you’ve ever searched for gutter guards, you’ve likely come across many gutter guard offerings. In 2010, there were no fewer than a dozen micromesh gutter guards on the market. There are at least 15-20 solid gutter covers on the market. There are many perforated aluminum gutter covers, and more plastic gutter covers from the likes of Amerimax, who is the dominate manufacturer of inexpensive, DIY PVC gutter guards. In other words, there are at least 50 gutter guards on the market today, and that’s probably being conservative. Some are available at your local home improvement store; some are available to gutter installers and roofers from wholesalers, while others are available only through gutter guard franchises and installer dealers. If the magazine only focused on a small selection of vehicles or appliances, you wouldn’t be able to make an informed decision about your next car, range or washing machine, would you? In the world of gutter guards, CR left a lot of manufacturers out of the review process. I would argue that they failed to include equally good or better gutter guards than what was reviewed. I heard from some manufacturers later that they thought it was an inside job — like Consumer Reports invited just a handful of companies to participate. Unlike buying a vehicle or appliances, which you can do anonymously, you can’t saunter into your local gutter guard dealer to buy a few feet of gutter guards. You can purchase Amerimax gutter guards at Home Depot, Lowe’s and Ace Hardware, but you cannot stop by LeafFilter in Ohio or GutterGlove in California and walk out with a few sections of gutter guards. It doesn’t work that way, so it raises the question, was this review truly independent or was it done in coordination with a handful of industry heavyweights? If you believe it was done without knowledge of the manufacturers, then Consumer Reports would have had to ask for a dealer to come to their testing facility and pay the company to have the 10’ of gutter guard installed by a pro. Installing 10 feet of gutter guard isn’t what a dealer gets excited about. It seems more probable that CR reached out the manufacturers and invited them to participate — explaining what they were doing, why they wanted the product and so little of it. Were gutter guard manufacturers intentionally excluded from Consumer Reports testing? I heard from at least 2 manufacturers that were left out of the review process. They were really upset that their products were not included in Consumer Reports best gutter guards review. Their viewpoint is totally understandable. Did CR reach out to them and they didn’t answer their phone? Was CR only familiar with a few of the major market players? Was this an invitation-only or “paid” review process by a select few manufacturers as the excluded manufacturers claim? Who knows, and that’s what so strange about this review, and why, in my opinion, Consumer Reports best gutter guards review lacks objectivity and credibility. It’s also one of the reasons I eventually dropped my subscription to Consumer Reports. Why they may know much about vehicles and lawn mowers, they don’t know jack about gutter guards. Why is it that in the intervening 8 years, Consumer Reports has never run another gutter guard review? I doubt it, but I find it interesting that one of he most confusing home improvement products hasn’t received more attention from this publication. In our article, Consumer Reports Reviews Gutter Guards: Leaffilter and GutterGlove are Top Picks, I said that I agreed with Consumer Reports that the micro screen gutter guards were the best picks. I still believe that to be true overall. They certainly are the most versatile gutter guards on the market. They’re not perfect, but no gutter guard is. Check out our article, “What is the best gutter guard for my home” to see what gutter guard is best suited for you. This article will give you a little more information about each type of gutter guard on the market and which one will work best for you. Here’s where my difference of opinion with Consumer Reports takes shape. Of the two microscreen gutter guards reviewed, neither of them is the best micromesh gutter guard on the market. To be perfectly honest, I was really shocked to see LeafFilter rated the #1 professionally installed gutter guard. In 2010, I was the dealer of record for LeafFilter in Tennessee and Kentucky. That’s right, I had the rights to sell LeafFilter across both states. I began installing LeafFilter in 2008, so by the time CR’s article hit the newsstands, I was intimately familiar with the product’s pros and cons. We had installed it on enough homes in my region for me to see and hear how it was working. The good news was that we had few issues or complaints, and the gutter guard worked well overall. I was invited to sell GutterGlove Pro, but I elected not to. It, too, had shortcomings. I believed that LeafFilter was a better product — with one exception. LeafFilter is made of PVC. That’s right…vinyl. Like in vinyl siding. What’s the hottest part of your house? If you guessed your roof, you’re correct. Have you ever touched asphalt shingles in the summer? Ouch, they’re hot. Like scalding water hot or hotter. On a hot summer day, it’s not unusual for temperatures on a black asphalt shingle roof to exceed 150 degrees Fahrenheit. Guess what the softening temperature on PVC is? 54-80 degrees Celsius! That’s 129-176 degrees Fahrenheit! What does that mean for any gutter guard made of PVC? It will expand, bend, and change shape — often permanently. LeafFilter’s PVC frame has warped at the ends of each section from the sun and heat, creating a convex shaped gutter guard. And that’s not good because the gutter guards will not withstand the constant temperature swings over an extended period of time. In the 3 years we installed LeafFilter — before individual dealerships were consolidated into a single nationwide franchise dealer — we encountered several instances where the gutter guards had aged poorly, deformed, and warped to the extent that the gutter guards were no longer usable. In one instance, the gutter guards plastic frame began discoloring within 6 months of our initial installation. In another instance, the gutter guards warped so badly that the upward pressure caused the threaded sheet metal screws we used to secure the guards to the gutter lip to pop off! In another case, the guards — which were sitting on the roof waiting to be installed became so pliable that the actually drooped when we picked them up to install them. Does Consumer Reports understand enough to know any gutter guards achilles heel? When rain water moves across asphalt shingles, water dislodges tar that is part of the shingle’s foundation. 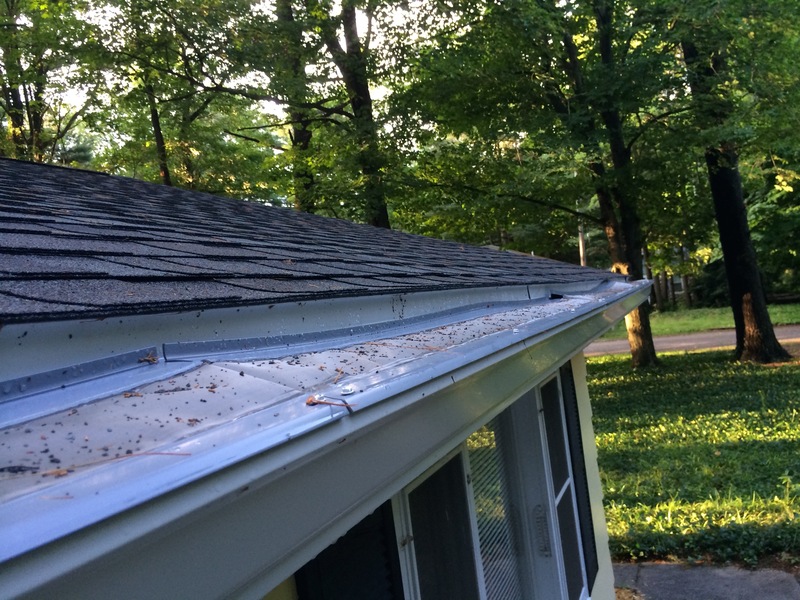 Tar becomes fluid like oil in hi-flow areas (such as a valley or on any section of roof below a downspout) and moves across the shingles into the gutter. If you have a micromesh gutter guard installed, the tar attaches to the micromesh screen and when it dries, it becomes virtually impossible to remove from the screen. This can clog the openings in the screen, causing water to spill over the gutter guards top. LeafFilter offers two types of screen: a very fine and more porous screen. The fine screen is intended for all the straight runs and the porous screen is intended for inside corners where water flow is greater. If the fine screen is used in these high flow areas instead of more porous screens, odds are the tar will accumulate and seal the openings in the screen. This issue is not unique to LeafFilter. It is also true with Gutter Glove and other micromesh gutter guards. 50 micron screens, such as those used on LeafFilter and Gutter Glove Pro are, in our opinion, are too fine for their intended purpose. 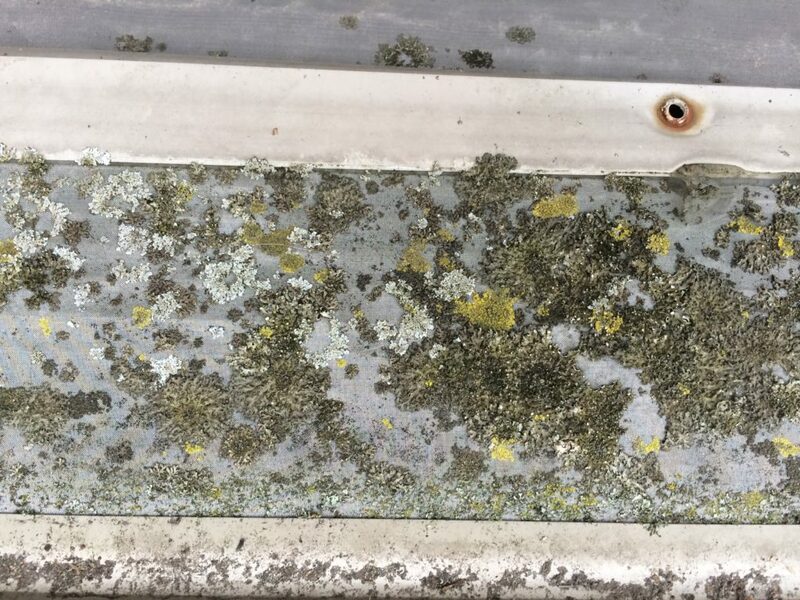 These ultra-fine screens have also been shown to grow moss and other organic matter on northern exposures and shaded areas of the gutter. 50 micron screen encourages the growth of organic matter on the screen. In this case, moss was actively growing on LeafFilter micromesh screen. Despite these issues, which are generally limited to a small area of any given home or can be eliminated altogether with proper care and planning, microscreen gutter guards have been proven to be the most effective gutter protection systems. 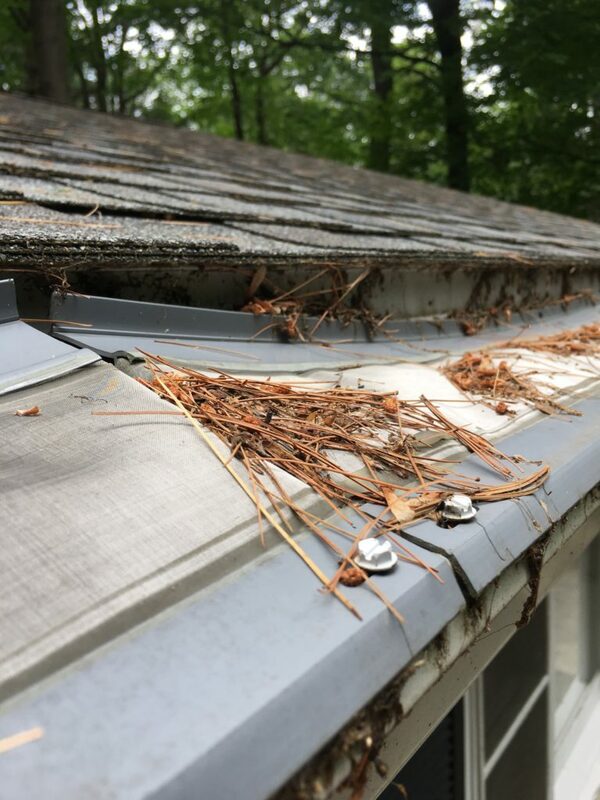 While Consumer Reports got that right, the fact that they limited their choices to 2 micromesh gutter guards and awarded them both #1 ratings for different classifications — professional and DIY installation — there are better systems on the market. In addition to searching for ‘best gutter guards Consumer Reports,’ also check out our YouTube videos from 2011 where we tested several gutter guards. And in order to get a better perspective about other micromesh gutter guards on the market, be sure to also consider offerings from MicroScreen, MasterShield, LeafSolution, and EasyOn by GutterGlove.